Greg was born and educated in Ararat and prior to working in the Real Estate industry, he successfully managed his own financial planning /insurance business for near on 25 years. In 2006 he commenced his career in Real Estate and by 2010 obtained his full Real Estate Agents License and prides himself on a wealth of market knowledge and is a member of REIV. Greg is the Officer in Effective Control of Landmark Harcourts Ararat and enjoys the variety and challenge of running his own agency on a day to day basis along with his hard working, client friendly team. Greg has a proven track record of outstanding results , recently winning the 2018 Rate My Agent " Agent of the Year" in Ararat, he also prides himself on having great experience in all facets of real estate including residential, rural/lifestyle properties and auctioneering as well as servicing a prolific rental agency. Greg is committed to providing his clients with the highest level of personal service and understands that buying or selling is one of the most important decisions you'll ever make, his aim is for all his clients to enjoy a stress free process with maximum results! In his spare time Greg is a keen Collingwood football club member and enjoys the challenge of playing golf at the picture perfect Chalambar golf course. Michelle is a lifelong resident of Ararat and joined the Landmark Harcourts Real Estate Team in 2015. 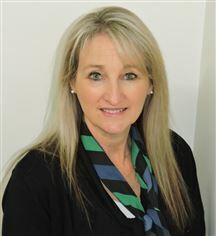 Michelle has over 18 years’ experience in office management and is well known within the Ararat community for her enthusiasm and dedication and has built and maintained strong relationships within the public and private sector. Real Estate Property Management can be a difficult role however Michelle understands the many needs and challenges associated with owning or renting a property. Communication is paramount and Michelle’s approachable personality, down to earth attitude, coupled with her sense of humour will ensure that issues are resolved in a timely and professional manner. Michelle is passionate about enhancing excellent customer service in Ararat and her belief that “nothing is too hard” will instil confidence in both current and future landlords and tenants. Making it into the prestigious top 20 Property Managers in 2017 & 2018 in Victoria, Michelle has what it takes to discuss and provide advice on any property management matters, why not give her a call today ! Kim commenced work in an administration support role with Landmark Harcourts Real Estate – Ararat, in April 2013. Kim has spent most of her career in the hospitality industry, with a short time in tourism. Prior to this Kim had the honor of being part of the local hospital team as the main receptionist for just over 8 years. Kim along with husband Greg have taken over the business in a co-agency capacity with Landmark Harcourt’s in Ararat and is committed to the highest level of personal & professional customer service to all her clients and work colleagues. She obtained a certificate for successfully completing her Agents Representative Course in 2013 to achieve a better understanding of the industry. Kim has two wonderful sons aged 25 and 23 and enjoys cooking, gardening, laughing and a good chat with a glass wine. Vendor Says Make Me An Offer ! What a Little Ripper ! You Can't Go Past This One! Ararat's Bargain of the Year !